Even if I'm in a country (Italy) where most people don't even know how to play it, I have been keeping up on baseball and more importantly with those vicious RedLegs that are destined to be more than mediocre this year. And yes Chris they have been making moves; Just NOT overpaying for mediocre talent to hyper-inflate the payroll, as some other teams are. Anyway, I noticed today as I was looking through the pictures of the first official FULL team practice in Sarasota how excited I am for baseball in general and my return to the U.S. in April just in time for the first week of the baseball season. Some interesting reading for those of you that care and for those that should care are: this nice bit about Johnny Cueto and what Mario Soto thinks about him. Yeah, that Mario Soto. 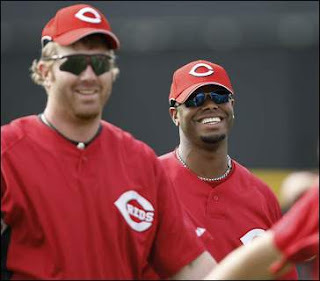 Also the contract extension progress or lack there of Adam Dunn. I personally think they are not going to be able to sign him to what he is worth long term; I see him in Houston or somewhere warm next year. And it looks like that one Uber-Prospect is impressive as well. On a sad note, Joe Nuxhall did not get into the Hall this time but "his time will come," according to a few notable sources including the great one--Marty Brennaman. And even more sad; the death of Bob Howsam, the basic architect of the greatest baseball team of all time. On a more fun note and back to Spring Training at least Juan Castro is good for something, tending to the new $40 million man. Check out the daily photos of each days practices and events at Ed Smith here on the main tabs, third one down listed as: "Photos". 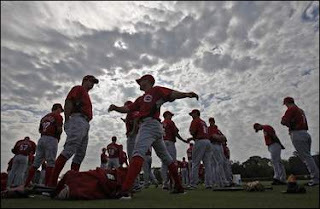 AND, lastly just look at these pictures of ol' Leatherpants at Washington Red...errr National's spring training complex. Jim Bowden, ohh Jim Bowden. Only you can think about Spring Training while in a beautiful country. That's what you call a die-hard fan, folks! From what I've read and heard, you are having the time of your life.